This week I decided to cook up a big pot of beans to to eat all week long. So healthy, simple, satisfying and delicious! And it makes enough that you can eat it for days. Normally, I like to soak my beans overnight to make them cook faster and to make them easier to digest, but in case you forget to soak them (which I did) here’s a secret to get them to cook perfectly anyway-cover the beans with water, bring the water to a boil, and then turn it off and let them sit for 1 hour. Then you can go ahead and cook them as if they had been soaked overnight, and they’ll be done in about an hour in a regular pot. I love this shortcut, since I am notoriously forgetful when it comes to starting food the day before. 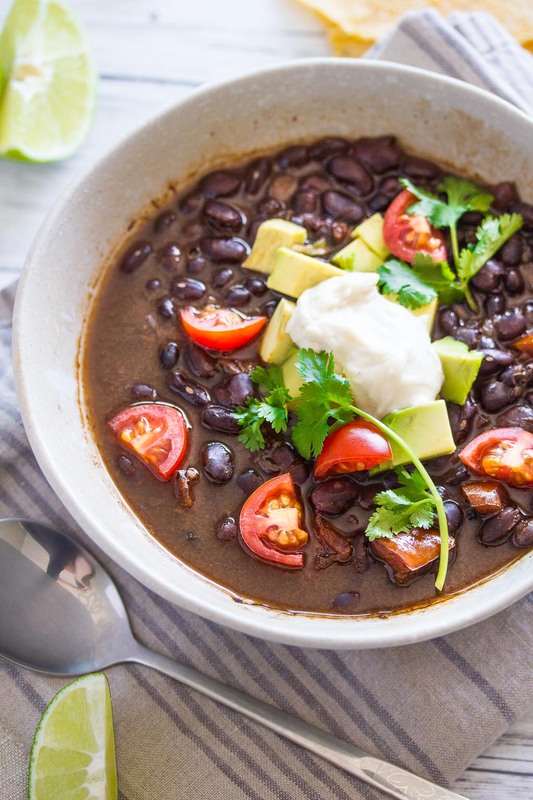 Add the black beans and 4 cups of water and salt to a boil and turn off the heat immediately. Allow to sit for 1 hour. Drain and rinse the beans. In a soup or stock pot, heat the olive oil over low heat and add the chopped onion and garlic. Sauté for 2-3 minutes and then add the oregano, and chili powder. Sauté for another 2 minutes over low heat. Add the chocolate powder, chipotle chili, paprika soaked black beans and 10 cups of water. Bring everything to a boil and then turn down the heat and simmer for 30 minutes covered and then another 30 minutes uncovered, or until the beans are tender. 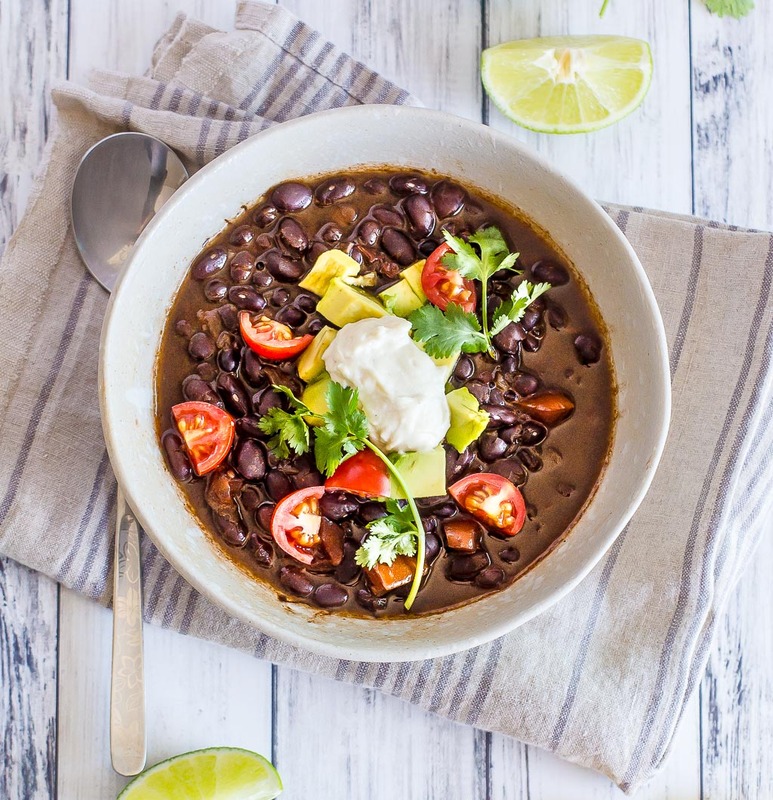 To serve, ladle some beans into separate bowls and serve topped with chopped avocado, tomato, cilantro, and coconut yogurt. Sliced onion, and jalapeno are also delicious as toppings. Dip the warm tortillas into the beans and enjoy! Looks great! Couple of questions: 1-Tomato is mentioned in cooking steps but not listed in cooked ingredients- how much and what form of tomato? 2- When do you add the beans in the cooking steps (it isn’t mentioned). Hi Kim! Thanks for pointing out that typo! 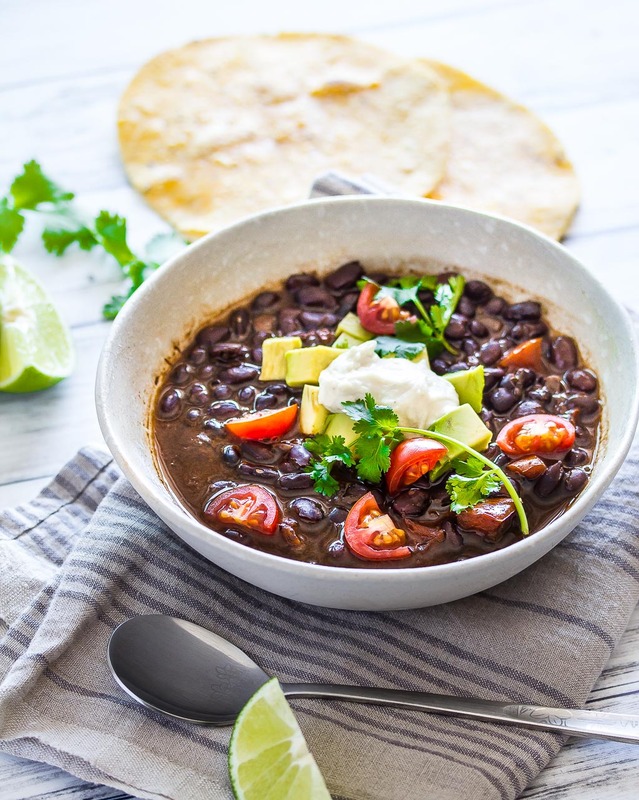 I used to make this recipes with tomatoes cooked with the beans, but changed it for this post by adding them as a fresh garnish to the cooked beans. I have updated the instructions. Thanks for drawing my attention to this!